The Tasty Little Cakery has been around a little while now and things needed freshening up a little. We wanted to give the brand a little makeover to something more vibrant and modern. Gone are the cream and brown colours, in is a bold new colour scheme with shades of pink and orange. The new logo keeps the emblem characteristics loyal to the TLC’s routes, whilst taking on a much more sleek and adaptable style. We’ve also adopted a new typography style. On every page’s header, you’ll see our new font pairings of the bubbly Quicksand and the sleek Sacramento. We love how the two fonts compliment each other, conveying a sense of tradition with a modern edge. 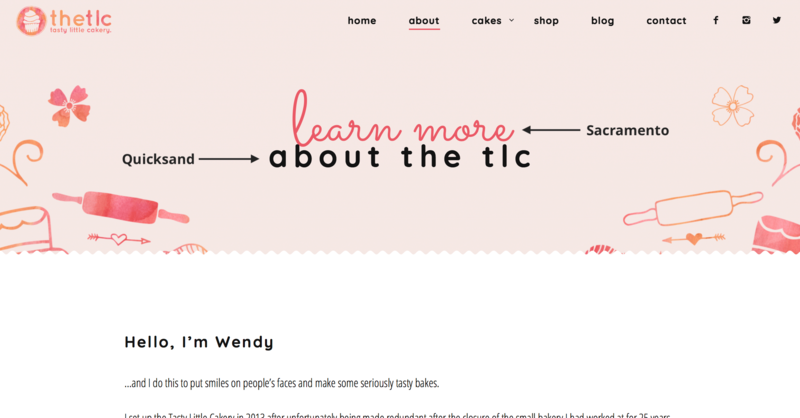 The typography embodies the character of the Tasty Little Cakery, where we hone experienced baking to produce new and exciting sweet creations. It’s hard to have imagined when I started this company just a few short years ago, the amount of support and success I’d receive in this short amount of time. It’s not been easy. It still isn’t at times. The late nights in the kitchen and missed family days out are all worth it to see this company grow. I genuinely cannot thank the people who support this company enough. It’s lovely to see the number of regular customers I have and is something I’m genuinely proud of. So what’s next? I’m looking to expand this company more and stretch our capabilities further. You may have noticed we have an online shop page on this site. (Exciting!) Unfortunately, we’re not quite ready to launch the online shop just yet, but its something I’ve wanted to make happen for a while now, it’s just really difficult logistics wise. What we have introduced though is our super simple cake enquiry form, be sure to check that out! We’ve also, of course, got this blogging platform now. I’ll admit now, I’m not sure how regular these posts are going to be, but I’d love to be able to do blog posts as often as possible. The intention with the blog is to share updates like these, as well as feature insights into the cakes I make and other fun things. If things get a little quite around here, as many of you know, I’m active over on our Facebook page and we’re now finally expanding to Instagram, so check out The TLC’s Instagram profile. So, one last time, I want to thank all of you for supporting The Tasty Little Cakery and I look forward to hopefully doing business with you lovely people in the future.